If you don’t know the name, you’ll know the face - he’s the one with the statement glasses. And you’re almost certain to know his work. Poul Henningsen is the Danish designer that gifted the world the PH 5 and the man who changed the course of lighting design forever. To say the PH 5 had an interesting start in life is an understatement. It was actually the designer’s mother who, displeased with the new incandescent light bulbs of the time, gave her son the inspiration to build the lamp we know and love today. While Henningsen’s mother didn’t care much for the harsh, unflattering light of the new bulbs, in truth nor did he. So, building upon one of his earlier models, he set about creating a lamp that would provide a flattering, glare-free light as close to natural light as possible. Henningsen was particularly meticulous about his new design. It needed to perform at a functional level, illuminating the entire room, not just the area below it. And it needed to look good too. To achieve this, Henningsen designed the lamp with five separate aluminium shades, all of which would surround the bulb and disperse the light in a different direction. Then, to ensure there’d be no visible transition in the light’s brightness when emitted in this way, he gave the shades a curved shape. The final piece of the puzzle was to neutralise the unpleasant yellowish tint of the incandescent bulb, a problem that led to the lamp’s most distinctive details: its blue reflector and red cone. Hidden inside the heart of the lamp, these clever pieces are what give the light its warm, natural feel. The rest, as they say, is history. Not only an instant success when it was released in 1958, the PH 5 is still Louis Poulsen’s most successful lighting design to date. To celebrate the PH 5’s 60th anniversary, Louis Poulsen has released the lamp in seven delicious colours: Red, Rose, Grey, Green, Orange, Blue and Modern White. The collection is designed to honour Henningsen’s commitment to both form and function, something we know he was a firm believer in. The lights provide the same glare-free, even illumination as the original, while their contemporary gradient exterior enhances its sculptural quality. The PH 5 Contemporary Hues collection is also available in a new mini size – a first for the PH 5. Measuring a diameter of 30cm (compared to the original 50cm), these pint-sized versions finally allow smaller homes to reap the rewards of Henningsen’s artistry. Released in celebration of the 60th Anniversary of the iconic design, meet the newest addition to the PH 5 family. The mini is now available in a raw, untreated copper finish which will age over time, gaining patina and personality. The Classic White PH 5 is the wedding gift of choice in its home country of Denmark, and we can see why. Like a marriage, it offers eternal commitment with a timeless look, flawless finish and near-unbreakable quality. If weddings aren't your thing, then the PH 5 would make an unforgettable birthday or housewarming gift too. We know that we'd be more than happy receiving one ourselves. The PH 5 isn't just loved for its beautiful aesthetic. 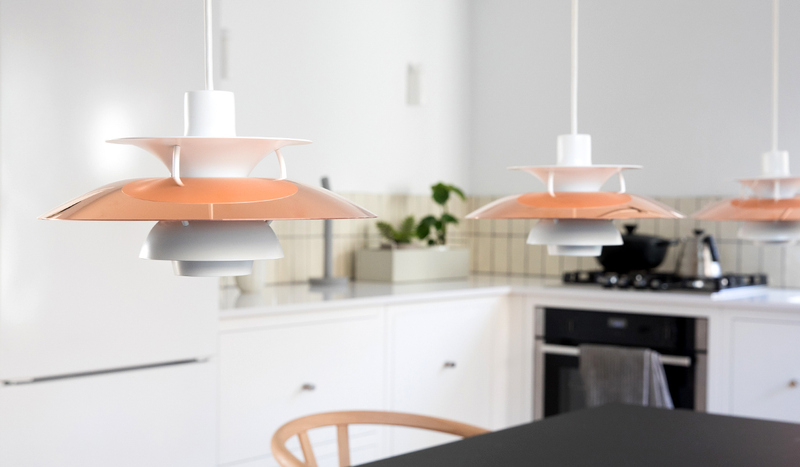 This classic pendant is found in so many Danish homes because it genuinely makes a difference to our quality of life, preventing the dreaded glare that causes a strain on the eyes and distributing light evenly for a warm, ambient glow. This is why the PH 5 is often seen suspended above the dining table, casting a balanced level of light that is bright enough for eating, yet gentle enough for a comfortable setting: Henningsen's intention all along. It doesn't matter if your home has high ceilings or low wooden beams — the PH 5 isn't fussy. It'll suspend beautifully in any setting, either on its own or with a row of PH 5 friends. It's entirely up to you. Thinking of welcoming this timeless classic into your home? Once you do, you won’t look back. In fact, as Poul once said, ‘once you have experienced real lighting, life is filled with new values.’ And we couldn’t agree more. Find your very own forever design online at Nest.co.uk today. Browse the PH 5 Pendant Light Classic White, PH 5 Pendant Light Contemporary Hues and PH 5 Mini Pendant Light. Got something to ask? We're here to help — simply email info@nest.co.uk, call 0114 243 3000 or message us on Live Chat.